The artist Milcho Bozhkov was awarded with this year?s ?Romphea Sword? award (see the photo above). 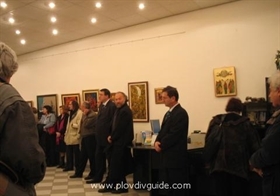 The official award-giving ceremony took place yesterday at the Romphea Art Gallery in Plovdiv. The award is given to the artist with the best exhibition throughout the year. Romphea scholarship award goes to the student of the Plvdiv High School of Arts, Vanya-Vanessa Katerincheva. The Romphea Sword is a copy of the weapon of the freedom-loving Thracian tribe Baesses, which the Romans could not enslave (some info here). The award is being given for the 12th time in a row?